It's a new month here at Talk Amongst Yourselves. We are still Kotaku's official forum, where you can talk about video games all you want. We've got new artwork for you to riff on. 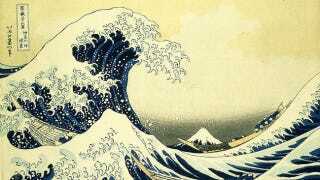 February's art is Katsushika Hokusai's 19th-century print The Great Waves of Kanagawa. We present it here with a 16x9 crop so it'll look great in our new layout. For those of you who aspire to have your work appear atop TAY, submit your Photoshops or other classy manipulations of Hosukai's work over at #TAYpics. Please note some new image requirements: 640 pixels wide, 360 tall, for a 16x9 aspect ratio. For your convenience that's the exact size I uploaded here.